Some of you are dealing with the cold, snow or other wintry like conditions. 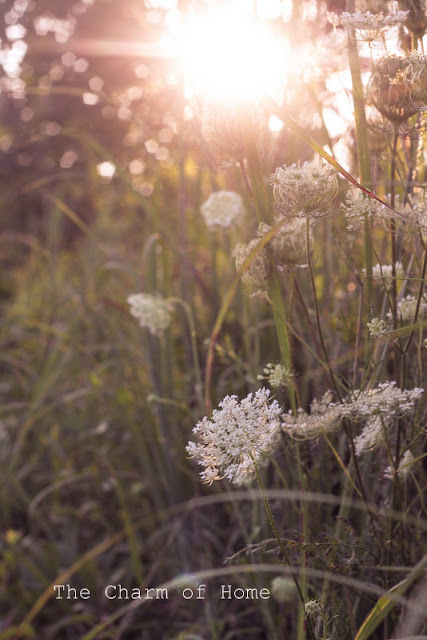 However, here in Florida, the weather is perfect for working outdoors and projects for the garden. I wanted to share with you my latest garden project - Decorative Garden Art. I had so many plates and stones and wanted to make some new garden art. I had made a path light cover using a globe. You can see that project here. 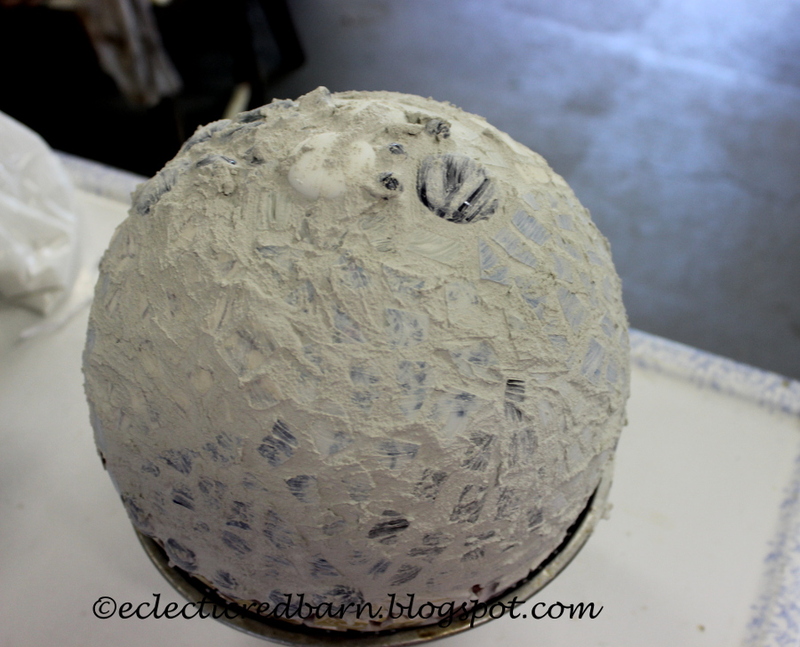 With that project, I glued on stones using an outdoor weather adhesive. It had to be clear so the light would shine through. For this project, I did not need to use clear glue. It would just be garden art. I wanted something that would hold the stones and broken glass in place. 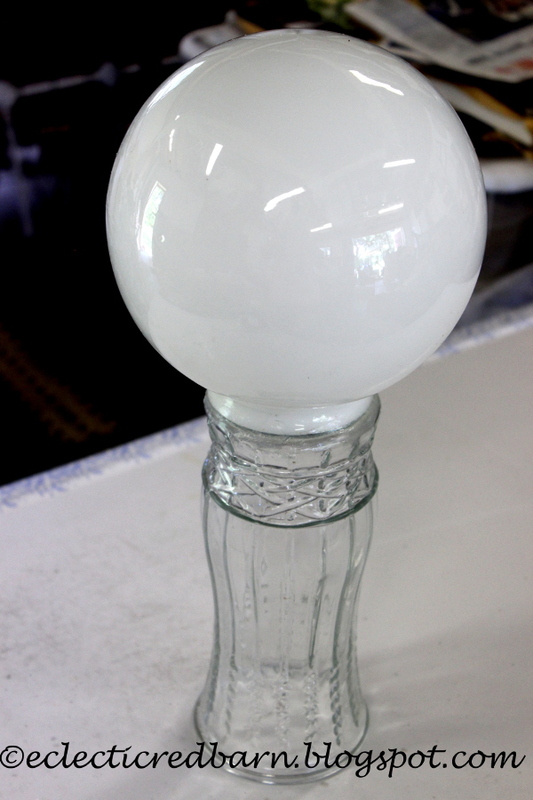 One of the problems I had with the light globe was that the glue did not dry fast enough and I could only work in a small area. Then I would have to let it dry before moving on. I practiced with a number of products and found that Thin-set Mortar was the answer. So now I could get started. 1. Glue a small globe to the top of an upturned vase with a weather-proof adhesive. You can get vases for 25 cents and yard sales. The globes are getting harder to find, but you can get them for around a $1. 2. Gather stones, broken plates, other objects that you might want to use. 3. Mix up a small amount of thin set mortar. Follow directions on the package. It needs to be a little thick but not too thick. 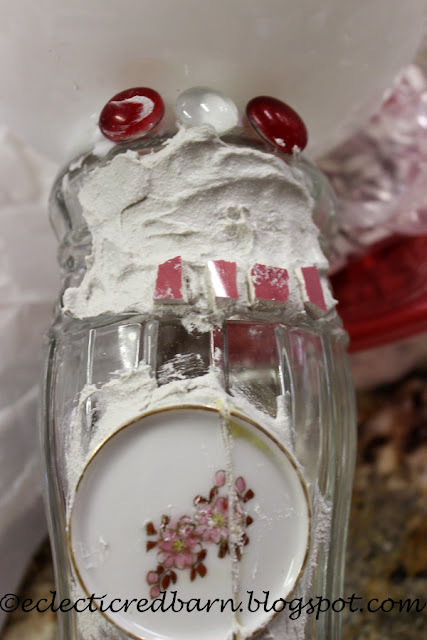 Place some on your piece with a spoon and smear it around. (I used plastic ones). Add your broken pieces to the thin set. They should adhere easily and not slide down. If it slides, you might need more thin set or it is too thin. In this picture, I added the thin set and then placed a row of pink pieces at the bottom and they stay put. This allows you to work on your project with out having to wait until it dries. I did not complete the project all at one time. This took me several days to complete. Mainly because of other obligations. This was some small disk that had cracked and I put it on and it stayed. You can add almost any material. I even added some mirror pieces, but you could add old jewelry pieces. Here is the middle section at the top completed. If you add too much thin set, you can always take a tooth pick and remove some of it. You do need to allow room for the grout to cover the pieces. 4. Complete adding pieces to all parts of the vase and globe. This was the second one I worked on. The pattern was just rows of stones and broken plate pieces that went around in a circle. 5. Here is one of them completed with all of the stones and glass pieces. For this one, the pattern was more random. 6. Now you need to grout your piece. 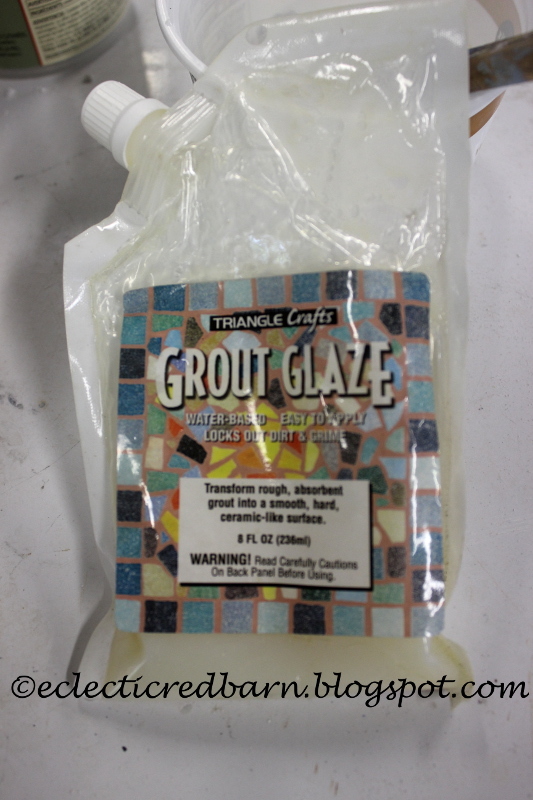 You can purchase a small amount of grout at any craft store or buy a large box at any Home Depot or Lowe's. When you grout, follow directions on the package. Cover the entire piece with the grout. You want to make sure to get into all the crevices. For some reason, I don't have a picture of these garden art pieces grouted but here is a bowling bowl that has been grouted. Let it dry. 7. Once it has dried completely, it is time to wipe it off. Get a wet sponge and begin wiping off the excess grout. It is best to have a bucket of water next to you and keep rinsing and wiping. When it is almost clean, I usually take a towel or rag and finish cleaning it. You will need to buff it to get off all of the grout residue. This is like grouting a back splash, if you have ever done that. 8. I usually let mine sit for a few hours and then wipe it one more time. Now it it time to add the glaze. Here is one I have but you can purchase grout glaze at most craft stores. Brands may vary. 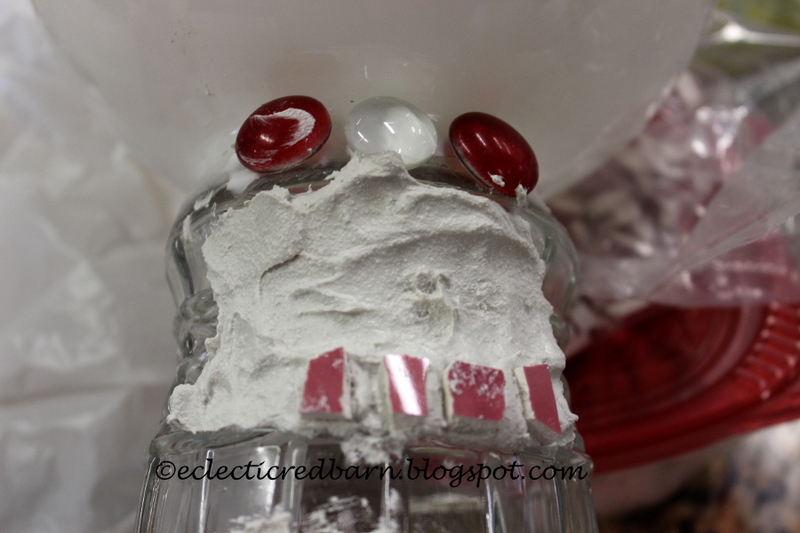 I put a small amount in a small container and use a soft brush and "paint" it onto the grout. It will become nice and hard and shinny. This sealer creates a very hard protective coating. Here it is in my garden. I used an old sledge hammer handle to hold it. I pounded the old handle into the ground and then placed the vase on top of it. It works great. If you have any questions, please let me know. It is a fun project with minimal expense. Create your own pattern, plus you get to break all of those plates and release tension. 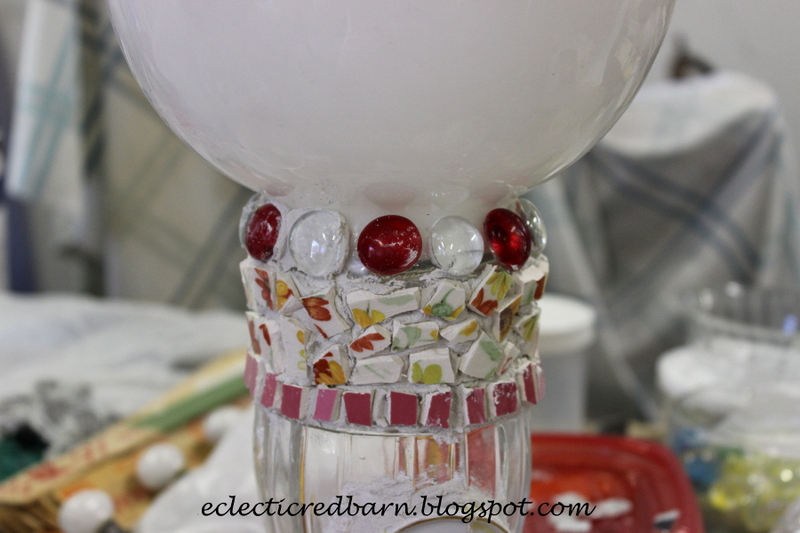 The post Decorative Garden Art - Using a Vase and a Globe first appeared on Eclectic Red Barn.